I have been to many wine tasting events. Some at local wine stores or country clubs. Others at someone's home. Along the way, I have picked up some tips on how to host a party that is casual and enjoyable even for your friends who are not wine savvy. Vertical Wine Tasting Party -- A tasting with an assortment of the same wine, from the same producer and vineyard, across several vintages (the year the grapes were harvested). An example is to taste Chardonnays from 2001, 2003 and 2006 all from the same vineyard. Horizontal Wine Tasting Party -- Tasting various wines from the same vintage and ideally, wines from the same region and general style. The purpose of tasting one vintage is mainly to compare the different producers and vineyards. For example, Napa Valley red wines from 2001. Blind Wine Tasting Party -- This is where you hide the identities of the wine by either wrapping them or putting them in paper bags. The bottles are numbered and scored without the tasters having the benefit of label, price, producer or anything else. Guest Choice -- This is the easiest wine tasting party to coordinate. Simply tell your guests to bring whatever kind of wine they choose. If you want to narrow them down a bit, be specific in your invitations, like "Bring a bottle of your favorite red wine, $20 limit" or "Bring your favorite bottle of Chardonnay, $15 limit." Obviously, you can combine some of these. How about hosting a Blind-Horizontal wine tasting party? If you are providing the wine yourself, keep in mind that a regular sized bottle of wine holds 750 milliliters or 25.4 ounces. You can buy measured wine pourers online for as cheap as $14.99 to ensure that every guest receives an exact measure every time you pour. NOTE: 1 fluid ounce = 2 tablespoons so if you have 12 guests and use the amber pourer, you will only use half of each bottle (about 12 ounces) during the tasting process, leaving the rest to enjoy after tasting is over. Make sure you buy additional bottles of various wine to serve before and after the tasting. If you have the space, set up 3 wine tasting stations; one for red wines, one for white and a third for dessert wines. Having separate tasting stations ensures that people spread out making it easier for everyone to get around the tables. Inevitably, there will be some spills and my friend Taylor has some great cleanup ideas. Click here to learn how to remove red wine stains from upholstery, carpet and clothing. If you choose to score wines, the scoring process should add a fun element to your party, not more stress for your guests. Make it simple. Create a scorecard that lists all of the wines and is easy to understand. Use our Free Wine Tasting Cards if you prefer. Clicking here will take you to a new page where you can sign up to immediately receive a free 7 page ebook filled with all sorts of party goodies, including our Tasting Scorecard, Wine-Cheese Pairing Table, Cheese Signs for your platters and an excellent recipe for Spiced Nuts. Print this 8-1/2 x 11 sheet and then fill in the names of the wines, by category, in the proper order (see "The Order of Wine Tasting" below). Make your guest copies on cardstock so they are more durable. An easy way to score wine is to ask your guests to force rank the reds separately from the whites and the desserts. Say you have 5 red wines to taste. Have them assign each a number, 1 being their most favorite, 5 being their least favorite. Have them do the same with the whites and with the dessert wines. At the end of the wine tasting, collect the cards and count up the ones (their favorites) in the red category, then white, then dessert. In each category you should end up with a single wine that received the most ones. 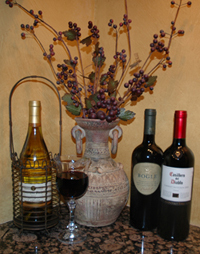 If your guests brought the wine, you can award prizes for the best wine chosen in each category. Wine charms and corkscrews are good choices. "Tonight, we are having what is called a Horizontal Wine Tasting which means we will be trying several wines from the same vintage. We are also doing a Blind Tasting which means you will not have the benefit of being able to see the labels, the price or the name of the vineyard." "We have 3 wine stations. The reds are in the living room, the whites are in the dining room and the dessert wines are in the bar area. Feel free to start where ever you would like." "Here is a scorecard. We ask that at each station, you force rank the wines, giving your favorite a one. At the end of the tasting, we will collect cards and announce the Top Wine in each category. Prizes will be awarded to whoever brought the number one wines." For more information about wine, visit my friend's website called Red Wine Passion. This website is for those people who are passionate about red wine in particular. 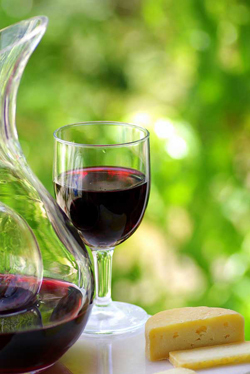 It's loaded with red wine facts, tips and recommendations for the everyday red wine drinker. It is a good idea to have your guests rinse out their glasses in between tastings. Also, they should cleanse their palettes by drinking water and eating crackers. 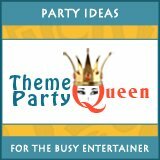 My friend Ashley created some fantastic printable theme party games including trivia games, word searches, scavenger hunts and Mad Libs. You won't believe how many occasions he covers; Halloween, Christmas, Super Bowl, BBQ, Valentines, Wine, Mardi Gras and Academy Awards, just to name a few. He even has a trivia game for every state in America. You can buy his printable party games individually or you can buy a multi-pack, like the one shown here. You get the convenience of buying them online plus you can download them immediately and use them over and over again. Click here to learn more about Ashley's Python Printable Games. 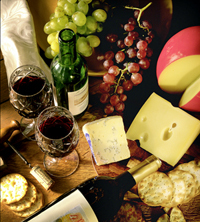 If I am hosting a wine tasting party, I like to create big platters of cheeses, olives, fruits, nuts and meats. For a party of 12, I would build 3 platters. Use our Wine-Cheese Pairing Table to design your platters. Clicking here will take you to a new page where you can sign up to immediately receive a free 7 page ebook filled with all sorts of party goodies, including our Wine-Cheese Pairing Table, a Tasting Scorecard, Cheese Signs for your platters and an excellent recipe for Spiced Nuts. For each wine type, I give you a selection of cheeses, meats and accompaniments so that your platters do not conflict with your wine choices. First, let's talk about the number of people you should have at a Wine Tasting Party. Personally, I think you should limit it to 10 - 12 people. I have been at larger wine tasting parties and it is just too crowded around the tables where the tastings are taking place. Also, a big part of a successful wine tasting party is being able to easily discuss the pros and cons of the wine and in a large group, conversation is difficult. Once you decide on how many people to invite, you will need to invite them! For most parties, I like to make my own invitations in Powerpoint, and you can watch a video of me doing just that, however for such a small number of people, I would step it up a notch and hand address some classy invitations that you can buy either online or a local party store. Most of us have been invited to parties where a certain dress code was required. I find these parties somewhat overwhelming because instead of just looking forward to a great party, I have to scramble around looking for special attire. Too much pressure. Instead, choose a color scheme for your wine party and ask your guests to wear those colors. Red, white and/or black for example? Everyone has something in their closet in these colors so no worries, man. Then choose invitations and decorations that match the scheme. The best part about the selection of wine glasses below is that they are all hand made for one of my favorite companies, Novica.com. In association with National Geographic, Novica.com features artisans from all over the world who hand create some of the most unique products including what you see below. All of your purchases help support these very special artists. Click on any link to learn more about the products and the artists who make them. We hope you love this glassware collection as much as we do. Planning and hosting a Wine Tasting Party does not need to be complicated. Wine and cheese decisions need to be made, that is true, but it is really all about getting together with some friends and enjoying each other's company. Just have a few great wines to try and some appetizers that pair nicely with the wine, chill out and have some fun.